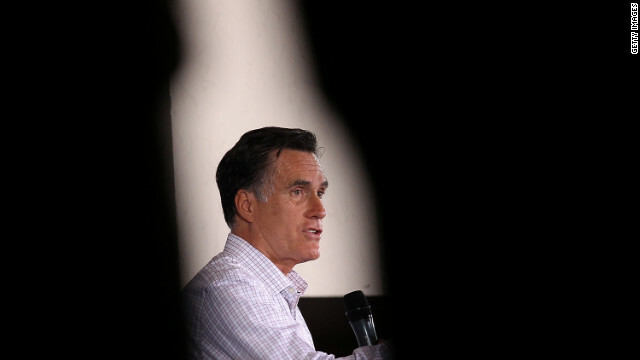 Poll: Romney the frontrunner in 2016? (CNN) - He's said over and over that he won't run for the White House a third time, but a new poll indicates that if Mitt Romney changed his mind and made another bid for president, he'd be the frontrunner among Republicans in the first-in-the-nation primary state of New Hampshire. According to the Suffolk University/Boston Herald survey, which was released Thursday, 24% of Granite State Republicans and independents who lean towards the GOP say that Romney would be their first choice for their party's presidential nomination. Among the potential 2016 GOP contenders, New Jersey Gov. Chris Christie was a distant second, at 9%, with Sen. Rand Paul of Kentucky at 8%, and former Florida Gov. Jeb Bush at 7%. While the survey may make headlines, it's important to remember that Romney's very well known in New Hampshire. He owns a vacation home in the state, has often appeared at GOP events in New Hampshire, and was governor of neighboring Massachusetts. Romney easily won the 2012 Republican primary, but lost the state by six percentage points to President Barack Obama in the general election. And the 2012 GOP presidential nominee has been very clear about his 2016 intentions. "I'm not running," Romney said Sunday on NBC's "Meet the Press," a line Romney's used in interviews every time he's asked about whether he'll make a third bid for the White House. Romney's wife, Ann, has also been adamant against another run. "Very sorry, Mrs. Romney. We had to ask the question," Suffolk University Political Research Center Director David Paleologos joked to CNN. Paleologos added that the results speak to "the weakness of the GOP field at this point in time." Without Romney, Christie and Paul were tied at 11% as the first choice for the nomination among Republicans in New Hampshire, with Bush and Sen. Ted Cruz of Texas each at 8%. The Suffolk University/Boston Herald poll was conducted June 14-15 and June 17-18, with 800 likely voters in New Hampshire questioned by telephone. The survey's overall sampling error is plus or minus 3.5 percentage points. How soon they forget about the 49% and growing!! America knows Romney would only be good for the mega wealthy. All others need not vote for him. Mitt Romney was correct about EVERYTHING including the 47%. I should have voted for him instead of the loser and incompetent one we now have running our country into the ground. America has become an embarrassment all over the world since we dumb clucks elected Obama. YOU DO NOT speak for the people. This country didn't have the good sense to elect a man of heart, humanity, grace, and business know-how. They've had two chances. What makes you think they'd get it right a third time? Just goes to further prove that Republicans do not, and will not, have a serious contender for the White House. Romney is just recycled garbage from the last Presidential election in which he was thumped by American voters. His views on the poor and struggling families in this country turned off voters of all walks of life. Republicans have not learned much from that. Look at how Republicans led by Boehner and Cantor refused to even allow a vote in the House on extending unemployment to more than three million families after the Senate approved the extension. Republicans have no compassion and they have no shame.Romney would be 1st nominee to lose to a black man and then a woman. No, please no, no, no. no!!!!!!!!!!!! Don't know if he would run again and do not blame him if he doesn't. But still believe that he would be the best person to lead our country out of the crisis we now find ourselves within. BUUAAAHAHAHAHAHA! Rummy run again, he'll have to open one of his bank accounts in the caymens or one of his swiss accounts! If Rummy is the best the repubs can do, BOY, they are in a heap of trouble! One thing I do know, The American People have not forgotten how the repubs shut this country down to try and move their agenda, they had little or no care for the American people when they did it! There is a price to pay, and they are going to pay it at the polls, You just saw what happened to their favorite speaker at the polls, and he was one of the elite for the republicans! They republicans will not run any of their elite buddies because they know the beating he is going to take, That is why they are picking outside the current ranks!! Hey, maybe they will run Palin! You know, then she can see what Putin is doing in Russia, She is just the type for the GOP to run, BUUUAAAHAHAHAHA! I definitely would vote for Romney again. I'm an Independent from MA. Romney was a good Gov. here. There were so many lies said about him but as I see it he would have made a much better President then the dingle berry that is our President right now. Romney said if you can't find a job you should just borrow money from your parents, "like my friend jimmy john." Who borrowed twenty thousand dollars from his parents to start his business. that's his jobs plan. it seems as though republicans are incapable of nominating someone who isn't insane or stupid. Romney couldn't defeat Jimmy Carter!! Bill, that "three strikes" comment was funny! Lets see: It started out as "Romney Care" then copied to "Obama Care" and then may be back to "Romney Care". Is there a dimes worth of difference between these MittBama twins? NO. Vote for RAND PAUL. Wake up America. Promises from politicians are usually worth less than the hot air used to make them. However, IF Romney runs yet again, and should he face Hillary (far from a given), this time we would have two 69 year old candidates, both of whom have been around the block a few times and have no personal financial worries to distract them or make them vulnerable to charges of bribery. One will, once again, trot out his "business acumen" albeit one based on ruthlessness and arrogance. The other can trot out her government and world experience, albeit facing an arsenal of hate propaganda long built up and stored by her adversaries. If that is the choice, I will go with Hillary in a heartbeat. But must that be the choice? As prominent a Democrat as Howard Dean, himself mentioned as a dark horse substitute if Hillary declines, has stated that younger blood needs to step up and apply for the job of President. Presumably, he was talking about younger blood that shows at least some slight acumen for the job, not the likes of Rand Paul or Marco Rubio. The Democrats do have a few hovering just out of sight, like Maryland's Martin O'Malley. The Republicans, if they have any truly viable candidates, are keeping it a deep secret. This is either smart tactics on their part, or evidence of a poverty of Presidential material in their ranks. It is impossible to tell which at this point.